We’d love your help. 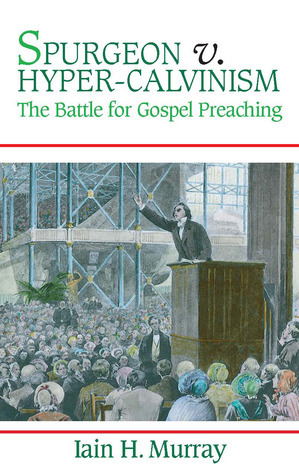 Let us know what’s wrong with this preview of Spurgeon v. Hyper-Calvinism by Iain H. Murray. To ask other readers questions about Spurgeon v. Hyper-Calvinism, please sign up. Excellent! This book if more widely read would help to dispel many mischaracterizations of Reformed believers. Recommends it for: All thinking followers of Christ. Murray knows his English Protestants. Here he provides us an excellent little book with an insight into one of Spurgeon's by now largely forgotten battles, a tangle with hyper-Calvinism that occurred early in his ministry. In this book, Murray shows us how Spurgeon took a stand against the more egregious aspects of Calvinism, especially those that prevented an active pursuit of the sinner. I am not a Calvinist, and sometimes that bothers me when I read Spurgeon. This book reassures me that Spurg Murray knows his English Protestants. Here he provides us an excellent little book with an insight into one of Spurgeon's by now largely forgotten battles, a tangle with hyper-Calvinism that occurred early in his ministry. In this book, Murray shows us how Spurgeon took a stand against the more egregious aspects of Calvinism, especially those that prevented an active pursuit of the sinner. I am not a Calvinist, and sometimes that bothers me when I read Spurgeon. This book reassures me that Spurgeon kept his Calvinism in check in this respect. It also reminds us that battles come to all of us in the ministry, big or little, famous or nondescript. Additionally, the book contains numerous excerpts and quotes from Spurgeon's sermons of that era that would be excellent all on their own. A pretty easy read that helped me better understand both the Truth and the error. Iain Murray is a dynamic yet thoughtful historian whom I would recommend to all Christians. This particular book is so short and easy to read that it would be a great first book for anyone interested in learning more about Calvinism, or as someone's first theological biography. This book was refreshing to my Calvinist soul. A critical book for the "young, restless, and Reformed," as well as anyone who adheres to Calvinist soteriology. Reveals hidden tendencies within our thinking and gospel proclamation that lean toward an unbiblical and ultra-Calvinist paradigm. Deals with the facts of Spurgeon's earliest controversy over hyper-Calvinism, as well as the theological topics of the universal gospel invitation, the warrant of faith, human responsibility (in relation to Go This book was refreshing to my Calvinist soul. A critical book for the "young, restless, and Reformed," as well as anyone who adheres to Calvinist soteriology. Reveals hidden tendencies within our thinking and gospel proclamation that lean toward an unbiblical and ultra-Calvinist paradigm. Deals with the facts of Spurgeon's earliest controversy over hyper-Calvinism, as well as the theological topics of the universal gospel invitation, the warrant of faith, human responsibility (in relation to God's sovereignty), and the love of God. Murray: "Free-agency is not to be confused with free-will. Since the Fall, men have not lost their responsibility but they have lost the ability, the will, to obey God." Spurgeon: "That God predestines, and that man is responsible, are two things that few can see." Spurgeon: "I believe in predestination, yea, even in its very jots and tittles. I believe that the path of a single grain of dust in the March wind is ordained and settled by a decree which cannot be violated; that every word and thought of man, every flittering of a sparrow's wing, every flight of a fly... that everything, in fact is foreknown and foreordained. But I do equally believe in the free agency of man, that man acts as he wills, especially in moral operations—choosing the evil with a will that is unbiased by anything that comes from God, biased only by his own depravity of heart and the perverseness of his habits; choosing the right too, with perfect freedom, though sacredly guided and led by the Holy Spirit... I believe that man is accountable as if there were no destiny whatsoever... Where these two truths meet I do not know, nor do I want to know. They do not puzzle me, since I have given up my mind to believing them both." Murray: "In the apostolic preaching to the lost, recorded in the book of Acts, nothing is said of the doctrine of election, while in the Epistles it is scarcely ever omitted. In accordance with this approach, Calvin, in the later editions of his Institutes, moved his treatment of election to follow teaching on justification. He recognized that Scripture generally introduces the doctrine of election to show believers their security and certainty of their salvation and to make clear who made them differ." This review has been hidden because it contains spoilers. To view it, click here. An excellent short work for anyone who is first acquainting himself with Spurgeon. 4. The love of God extends to all, not just the elect. That subjective experi An excellent short work for anyone who is first acquainting himself with Spurgeon. This book is useful for understanding C. H. Spurgeon's battles with genuine hyper-Calvinism. The problem is that the author lumps high-Calvinism in with hyper-Calvinism, and thus assumes that anyone who denies that God sincerely loves and desires the salvation of the reprobate is a hyper-Calvinist. Like Spurgeon, Iain Murray delights in Paradox Theology as a cloak for the irrationality of his views. Neither man understood the difference between a mystery that is beyond full comprehension by huma This book is useful for understanding C. H. Spurgeon's battles with genuine hyper-Calvinism. The problem is that the author lumps high-Calvinism in with hyper-Calvinism, and thus assumes that anyone who denies that God sincerely loves and desires the salvation of the reprobate is a hyper-Calvinist. Like Spurgeon, Iain Murray delights in Paradox Theology as a cloak for the irrationality of his views. Neither man understood the difference between a mystery that is beyond full comprehension by human beings (such as the Trinity) and a blatant contradiction. Love this book and loved reading it again! What warrant does the sinner have to believe that God will accept all those who trust in Christ, whoever they are and however black their s Love this book and loved reading it again! What warrant does the sinner have to believe that God will accept all those who trust in Christ, whoever they are and however black their sins might be? Simply God's free invitation and promise that ALL who believe on Christ will be saved. It is human nature to take any biblical truth and twist it to either extreme. Murray, whose “The Forgotten Spurgeon” dealt with the famous preacher’s Ariminian conflict, now visits Spurgeon’s battle with the opposite extreme—hyper-Calvinism. Many in Spurgeon’s day refused to extend the gospel to the lost, an error he counters with four Scriptural truths, which Murray details in these pages. This short work is valuable for both its historical record and its theological astuteness. The more I read about Spurgeon the more I grow to like and admire him. Far from the kind of guy you might have thought or been taught he was, this book shows more of him as a man totally reliant on God and standing alone, even in a great controversy surrounding his beloved doctrines of Grace. Murray does an excellent job again in presenting a biography not just about a man, but God working through a man. It is a great book defending true Calvinism against Hyper-Calvinism by presenting Spurgeon's view on this controversy. Every Christian who admires Spurgeon and oppose Calvinism should take time to read it to find out how Spurgeon viewed Calvinism as a five-point Calvinist. Spurgeon strikes a biblical balance between divine sovereignty and human responsibility, never denying either. He brings great wisdom for both tracks. I'm grateful for men who say, I don't understand how they work together, but I will preach them because they are in the Word. This book helped me understand a lot of particulars in Calvinistic theology during a time where I was in need of gentle correction in my theology. Really good and practical explanation of the difference between Calvinism and Hypers. The book is 3 parts. One part brief biography. One part theological case study. And one part objections to the bias. A good book overall, but not stellar. I do love reading Iain Murray, and look forward to reading more of his works. Definitely a book from the meatier end of the buffet of 'modern' Christian literature. Well written though and I mostly agree with Murray and (conveniently!) Spurgeon. Excellent. Very informative book. It made a lot of the distinctions of hyper Calvinism clearer. An excellent book, which dispels many caricatures of Calvinism, and sets a sound and Biblical course for theology and ministry. I admire Charles Spurgeon greatly, and thank God for his life. Fantastic book with lots of insight on Spurgeon's thoughts of Calvinism and Hyper-Calvinism. Very interesting history of the 19th Century church and the popular preachers during that time period. Very good author...makes the whole controversy interesting.